The gender wage gap is the difference in earnings between women and men in the workplace. It is a widely recognized indicator of the economic inequality facing working women. A 2015 United Nations Human Rights report raised concerns about “the persisting inequalities between women and men” in Canada, including the “high level of the pay gap” and its disproportionate effect on low-income women, racialized women, and Indigenous women. Canada is ranked as having the 8th highest gender pay gap out of a list of 43 countries examined by the Organisation for Economic Co-operation and Development (OECD). Is the wage gap the same for all women? No. Although statistical averages are good indicators of how women are being compensated in the workplace, Indigenous, racialized, disabled and newcomer women all experience the wage gap in different ways, for a variety of reasons. Indigenous women working full-time, full-year earn an average of 35% less than non-Indigenous men, earning 65 cents to the dollar. Racialized women working full-time, full year earn an average of 33% less than non-racialized men, earning 67 cents to the dollar. Newcomer women working full-time, full-year earn an average of 29% less than non-newcomer men, earning 71 cents to the dollar. Women with a disability in Canada working full- and part-time earn approximately 54 cents to the dollar when compared to the earnings of non-disabled men, equaling a wage gap of around 46%. Most women workers are employed in lower-wage occupations and lower-paid industries. Women work in a narrower range of occupations than men and have high representation in the 20 lowest-paid occupations. A large portion of the wage gap remains unexplained and is partly due to discrimination. An estimated 10-15% of the wage gap is attributed to gender-based wage discrimination or other unexplained factors. It will take around 217 years to close the economic gender gap worldwide if present trends continue. 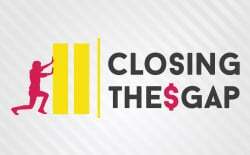 How can we eliminate the gender wage gap? 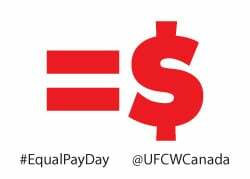 Together, we can urge provincial governments to make equal pay for equal work a reality for all working women in Canada. Send a message to your provincial government leaders today to put an end to the gender wage gap.